In 1947 the pro tour was unrecognizable compared to today. 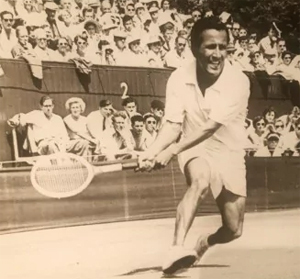 It is almost impossible for people today to imagine the kind of life professional tennis players led in the years between 1947 when Pancho Segura signed on to Jack Harris's professional tour and 1968, the year tennis became open. The opening event of Harris's newly formed tour took place at Madison Square Garden on December 26, 1947. There had been a snowstorm, and most transportation was cancelled. But in spite of the weather, over fifteen thousand fans turned out to see Bobby Riggs and his newly minted professional teammates—Jack Kramer, Dinny Pails, and Segura--play on a wooden surface laid over the ice hockey rink—a typical ad hoc court for pro tennis at that time, regardless of how cold the players' feet might feel. The Australian Pails beat Segura in the opening match, which had to be shortened to one epic length set. The score was 15-13 and Harris stopped the match there to make time for the headliners. Then Bobby Riggs and Jack Kramer came onto the court, and Riggs beat the new star in a tough 6-2, 10-8, 4-6, 6-4 struggle. Immediately afterward the four men took a train to Pittsburgh and played the whole thing over again, Pails and Riggs again edging out their rivals.